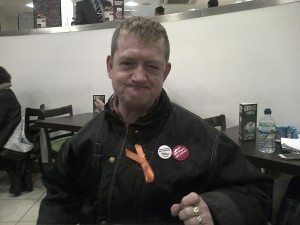 Disabled activists are at the forefront of the campaign in Barnet to stop the sell off of public services to private companies. Barnet Alliance for Public Services (BAPS) brings together a wide section of the community to fight privatisation. Last week Maria Nash was in the high court taking a legal challenge against Barnet Council’s failure to adequately consult or pay due regard to the impact of outsourcing Council services to Capita for a period of ten years. On Saturday 20th March disabled campaigners led the ‘Barnet Spring’ march (ironically through a blizzard of snow). Philip Rackham, Chair of Barnet Centre for Independent Living, is a key member of the campaign and sat through the three day court hearing in support of Maria. Why do think campaigning is important? I’m a fighter. I was abused mentally, emotionally, physically by my Mum. She told me she wished I’d never been born. I used to think am I worth it? But I know I am now. I got away from my Mum and I’ve had my own flat for eleven years. I was married for five years to Suzy. When we got together her Mum didn’t think I could look after her but I did. I used to carry her up the steps to her flat. She died and I miss her like anything. But I keep fighting. Why did you get involved with BAPS? I’ve lived in Barnet all my life. Cuts put disabled people down. They’re trying to cut my care package. That’s not right. I sat through the court case. It was difficult, I found it heavy. I have learning difficulties see? But you have to do it. If you don’t fight back, you don’t get anywhere.